can other designs, for example the earthbag lodge, be built on top of this? Yes. Excellent idea! I hadn’t thought of this yet. The main drawback is the difficulty and cost of digging deeper. First, choose high ground with soil that’s not too difficult to dig. Build the top of the survival shelter just a little below grade (1′-2′ deep). This would give you good protection against any fallout, fire, etc. from above. Then build the main house (Earthbag Lodge, etc.) on top. Then add earth against the sides of the Lodge and over the roof (earth sheltering). Also note, the soil from the Survival Shelter could be used as berming around the top structure. Hello, I can’t afford the plan but I was just curious what is the building structure and walls made from? The walls are made with earthbags — same thing as polypropylene sandbags, but filled with tamped soil instead of loose sand. This creates a solid tamped earth block. You can stabilize the soil in the bags with lime or cement for greater durability and water resistance. Protect the walls with black plastic sheeting. The roof is made of large wood timbers. You could add it to the lower 1-2 courses if you live where there’s high risk of moisture problems, but it’s easier and better to add lime or cement. My general recommendation is to raise soil filled earthbags on gravel filled bags (gravel bags) and then you don’t need any stabilizers. Is there any natural sunlight? Not in this design. This shelter is primary for short periods of time to weather a tornado,etc. You could add a solar tube/sun tube type of skylight, although this would create an opening into the shelter that could cause problems. For instance, a tornado could break the cover and allow water to enter. So this protects against floods as well? This design is for a typical climate. It is not suitable for areas with high water tables or areas with high risk of flooding. In areas like these, you’d want to build ‘on grade’ on high ground and use earth-sheltering (earth mounded over the whole structures once it’s complete). Feel free to ask questions. Hi, can you coat the exterior side of the wall or even the whole bags with tar? I am asking this becouse of moisture from earth and air (dont want to get it in the house), or will it interfere with the drying of the earth in the bags? Does the earth even need to driedout in the bags ? The earthbags need to dry to obtain full strength and moisture needs to transfer through the wall, so moisture barriers are typically not recommended except for below grade applications. Not sure what you’re getting at. Yes, moisture will be released into the home as the earthbags dry. But once they’re dry, that’s it. You want the earthbags to stay dry and strong. The bags are made with woven poly fabric that allows moisture to pass through. Is this a problem when you build underground? My plan is to make a dome shelter and than bury it with soil so it wont be visible, so every time it rains the water will eventualy reach my earthbag roof, and thats going to moisture the soil in the bags again and again, this in a way is not a problem if you use a dehumidifire, becouse you have a constant supply of water in the water tank, but is it safe, becouse it never dries out? should i build it, cover the exterior wall with tar, bury it and dry it from the inside ? The earthbags have to stay dry and hard or the dome will collapse. Living in Oklahoma, we’d like to have a shelter/basement. I suppose we could use a traditional square or rectangle design as well? I was also wondering about building on top of this. Or perhaps over a portion of it so as to enter the shelter from the main house? The main issue is building above the water table. It’s best for drier climates. Build on high ground where water flows away from the building in all directions. No problem building on top. Earthbags have 10x the bearing strength of 2×4 walls. I like this design. What kind of water vapor barrier would be needed to protect the bags from the ground water. How does the drainage system for the bathroom and kitchen areas work?? This is shown in the plan. Basically, it’s best to build on high ground in dry climates and low water table to avoid moisture problems. Use 6 mil poly sheeting on the outside. Is the design scaleable? 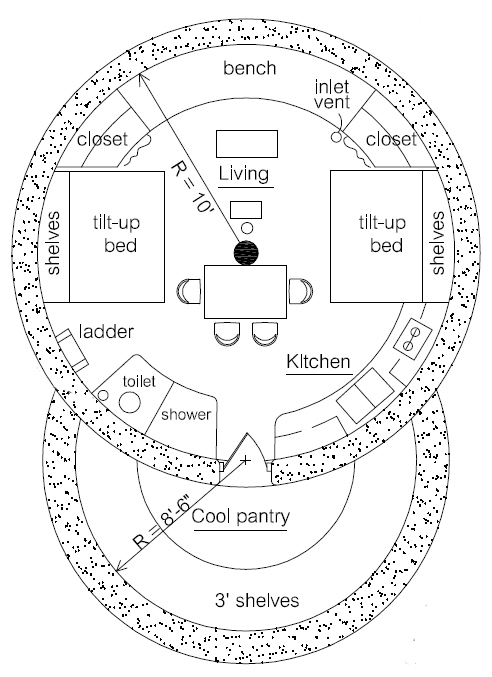 I need a design that will give more than 314 sq ft. as it is impractical for more than a day or so and not practical at all when “nature calls”… Can more ‘pantry’ areas be added at each cardinal point to allow facilities, storage, cooking and bunking arrangements? Can multiple sets be connected? A usable 1000-1500 sq ft is needed – can they be connected in a star formation ie one central chamber with 4 chambers on each quadrant to allow for a total space of circa 1500 sq ft and a usable area near the 1100-1200 sq ft region compensating for the dome height near the footing? Yes, it’s scaleable up to 20′ diameter or so. This is the most popular type of earthbag structure. Thousands of similar domes have been built all over the world, mostly by novices with little or no training. They’ve probably been built in countless configurations. Your idea would work. You can build one at a time as long as you plan ahead for doors and windows. Most people plaster them. 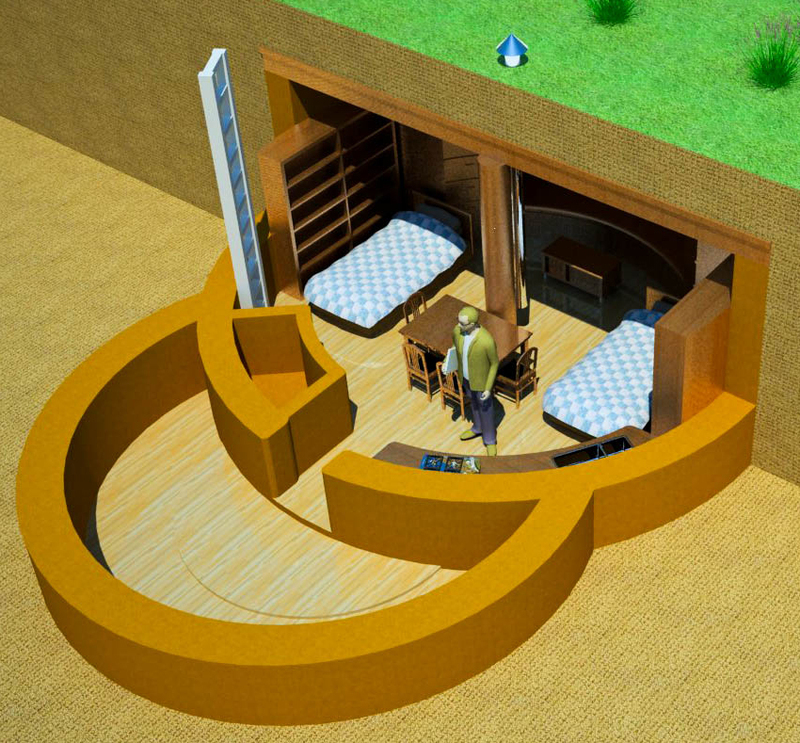 The shelter would be underground, is the underground shelter scaleable given the additional weight of the earth / overburden? Just want to confirm it applies to underground structures. An earthbag dome will easily support the weight of the earth if you build carefully and follow the advice on our sites, my book, and Doni and Kaki’s book. This includes making sure the soil in your earthbags doesn’t get wet and turn to mud, etc. I highly recommend stabilizng all the bags with cement or lime so this doesn’t happen. Yes, I don’t recommend going larger than this. Tubes will likely prove to be faster, easier and stronger than bags. on July 24, 2012 at 3:53 pm Getting the new house ready for LENR: Owen Geiger on natural building | COLD FUSION NOW! These old fallout shelter manuals are helpful. And yes, you can build these with earthbags if you keep the wall length short and provide adequate drainage and waterproofing. They would work best in dry areas. Round shapes are inherently stronger though and so I would lean towards a roundhouse with a flat or slightly sloping roof. They go up pretty fast because there are no corners. Tubes are faster than bags if you can find them. Domes are best if you plan to bury them deeply. You are logged in as “XXXXXXXXXXXXX” and do not have the necessary privileges to access the dashboard for “Free House Plans”. If you are not “XXXXXXXXXXXXX”, please log out, and log back in with your username. If you are “XXXXXXXXXXXXX” and you need access, please ask an administrator of the site to invite you. Do you have any suggestions for turning your home into a fall-out shelter? I live on Guam and our house is fully concrete (pre-fab slabs). Walls not very thick but I get worried because I have 2 small children about how safe we are going to be – especially with venitllation (Guam is hot). Any advice you have would be appreciated. You could stack earthbags around the outside of the house to help block the wind. You could stack them right next to the house if you extend the roof. Make sure you have strong hurricane ties on your roof. You could also build a small storm shelter in the back of the house with earthbags. Add strong shutters to all windows.